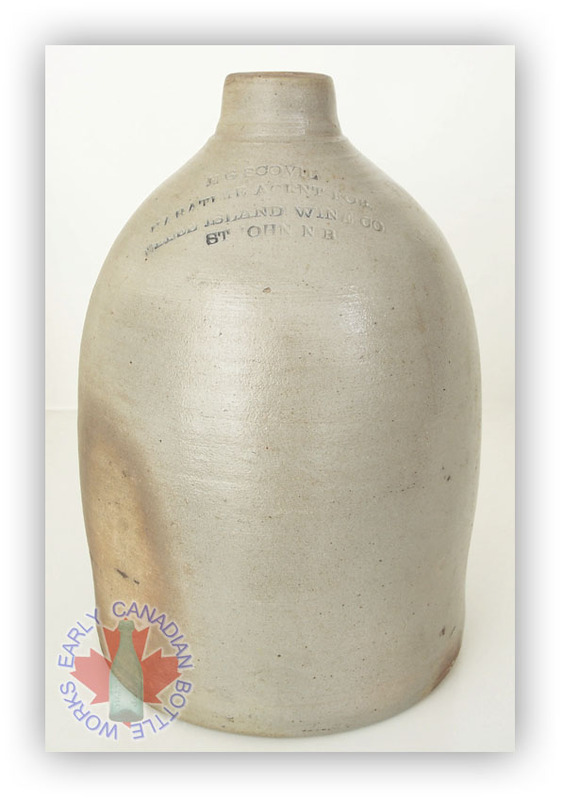 This collection of Pelee Island Wine Co. stoneware has been generously donated by a anonymous Toronto Collector. None of the pieces pictured here are for sale. J.S. 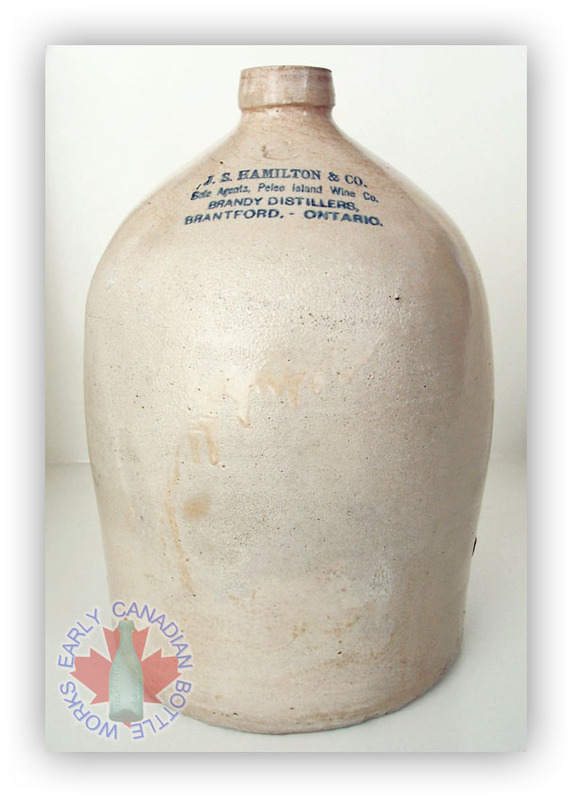 HAMILTON & CO. / SOLE AGENTS, PELEE ISLAND WINE CO. / BRANDY DISTILLERS, / BRANTFORD, - ONTARIO. 1/4 gallon J.S. Hamilton & Co.
J.S. 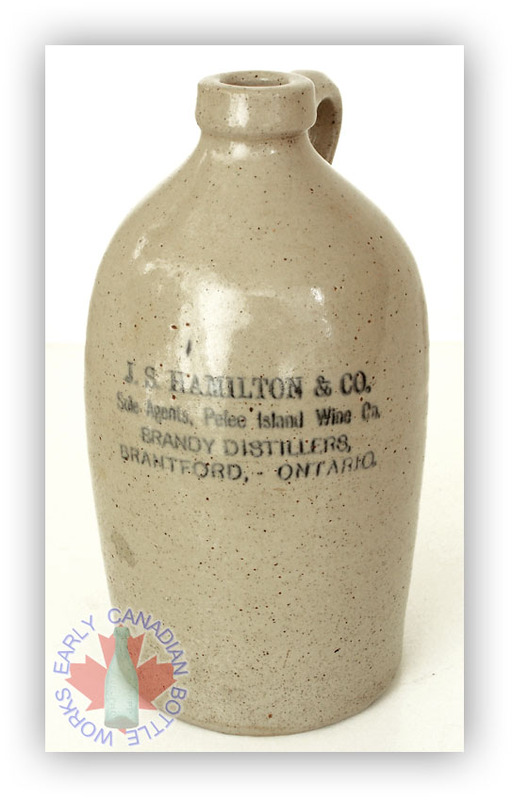 HAMILTON & CO. / SOLE AGENTS, PELEE ISLAND WINE CO. / BRANDY DISTILLERS, / BRANTFORD, - ONTARIO. J.S. 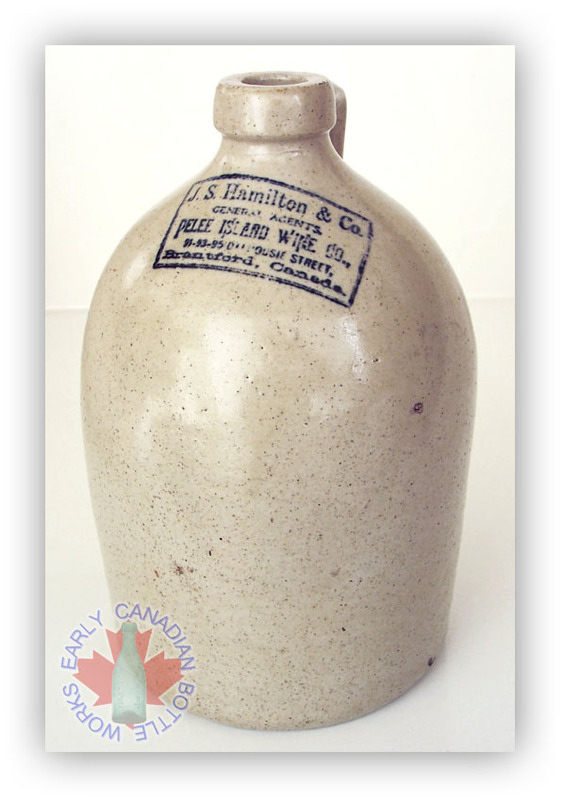 Hamilton & Co.
J.S. HAMILTON & CO. / GENERAL AGENTS, / PELEE ISLAND WINE CO., / 91-93-95 DALHOUSIE STREET, BRANTFORD, CANADA. J.S. 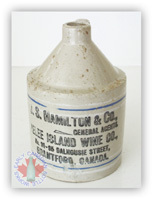 HAMILTON & CO., / GENERAL AGENTS / PELEE ISLAND WINE CO., / NO. 91-95 DALHOUSIE STREET, / BRANTFORD, CANADA. 1/4 gallon marked Toronto Pottery on heel. J.S. Hamilton & Co.
J.S. HAMILTON & CO., / GENERAL AGENTS. / PELCE ISLAND WINE CO., / NO. 91-95 DALHOUSIE STREET, / BRANTFORD, CANADA. 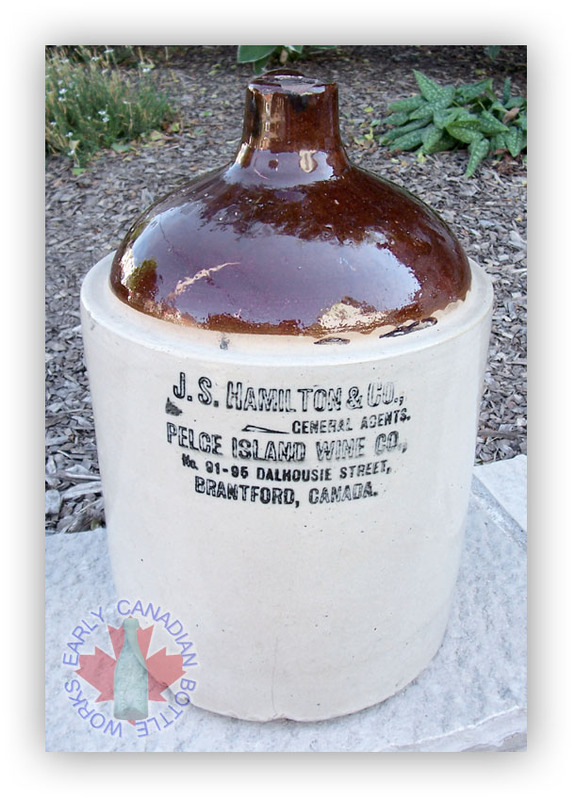 Note the misspelling of Maritime on this jug. 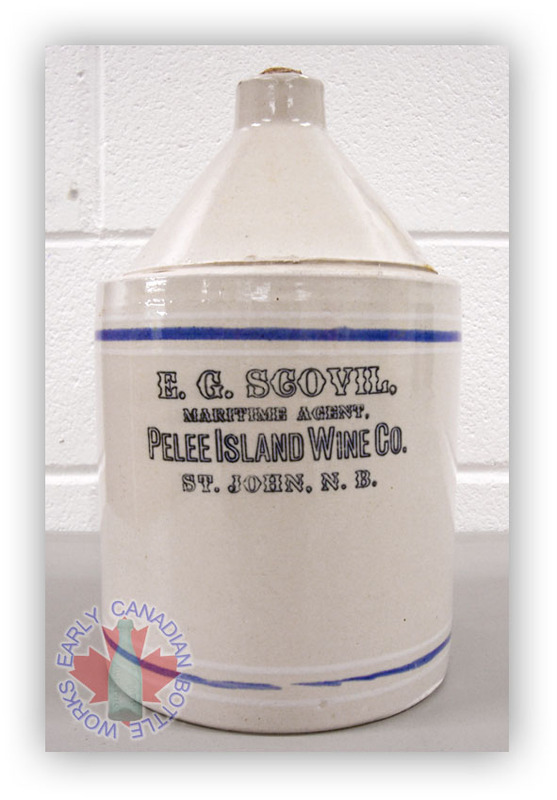 E G SCOVIL, / MARITIME AGENT, / PELEE ISLAND WINE CO. / ST. JOHN, N.B.